you choose for a healthy life. When it comes to coconut nutrition, you can write a book about it. There are endless health benefits of coconut. The whole tree is the source of all nature healing and incredible good source of all vitamins that you need for a healthier life. There is a myth that coconut is unhealthy. That’s really based on the high saturated fats in coconut. But you will see why coconut is so incredible healthy for your body. Just follow the story and by the end of this page, you will no other products than the organic coconut products. It’s truly a diamond for a healthy life. The origin of coconut tree is pretty unknown. There are many option where they originated came from, South Asia, or Bangladesh, India, Sri Lanka, New Zealand, or South America. The form of coconuts is oval and covered with a smooth skin. The color can be vary, it depends of they are young or old. It has a bright green color or orange or even ivory. Young Coconut is pretty much tender, it’s containing more coconut water than meat. The meat of young coconut is soft and gelatinous and the water is sweet. It’s really delicious and they are highly nutritious. It contains sugar, vitamin E, amino acid, minerals and antioxidant. Most of the time it consumed as a thirst quenching in the tropical island such as Indonesia or Malaysia. You can easily obtain them in these Asian countries but in western countries, it’s pretty much difficult to find young coconut. You can probably find them at the Chinese supermarket. When the coconut is mature and has ripened and the outer husk has turned brown, it will falls from the palm tree. The coconut meat has thickened and hardened, this is the meat that you can use to make coconut milk. And the water from ripened coconut is bitter and sour. Underneath the skin of coconut there is a thick fibrous layer. This can be used for coir. In some places in Indonesia this layer used by many people for washing dishes. And at the next layer, you’ll find the shell which is very hard and useful to make charcoal, carving or some eating utensils. Inside the shell you’ll find the white flesh layer, the meat of coconut, the component to make coconut milk, coconut cream, coconut oil and coconut flour which are very high in nutritional value. And not to forget, the palm tree, the tree of coconut produced also sweet nectar from the blossoms which is very useful to make nature sweeteners called palm sugar which also has a high benefits like any other coconut products. Coconut oil is one of the most great benefit of coconut nutrition. The most wonderful product of the coconut. 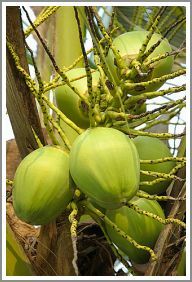 The oil of coconut is unique and different than any other oil. It’s the best and the healthiest oil in the world. Coconut oil contains high saturated fat, about 92 %. This is why many people afraid of consumed this oil, but that’s the component which makes this oil so healthy. This fat is very different than any other fat called long chain fatty acids. Coconut oil contains medium chain fatty acids which are very quickly absorbed by the body, so it hasn’t time to store it as a body fat. This fact makes this oil very suit to lose some weight. Because of the high amount of saturated fat, it makes the oil very stable when it’s heated. So it makes the excellent oil for cooking and frying. To get the benefits of the oil, you can start by cooking with this oil. There are a lot healthy recipes to make stir fry vegetables with coconut oil. Or if you like yoghurt or any other fruit smoothie, mix them with this oil. It’s really taste great. You will taste the coconut fragrance especially if you mix it with vanilla yoghurt. If you never cook with coconut oil, you might have to get used to the special taste of this oil. It's really dominated the whole dishes. If you make fried rice with coconut oil, you can really taste the coconut fragrance in it. So I suggest you to cook with coconut milk in the beginning to get used to the taste of the strong fragrance of the coconut oil. Using Coconut Milk in your cooking gives that creamy taste and certainly fulfilled your hungry stomach so you don't desire any other food for a couple of hours. Good for your diet. Another high coconut nutrition product. Coconut flour is high in fiber, gluten free, low carbohydrate and high in protein. This flour content 14% of coconut oil, 58% dietary fiber and 28% of water, protein and carbohydrate. So if you are allergic to gluten, this flour might be a solution for you. If you make some dessert or cake the wheat flour can be completely replaced by the coconut flour but you have to added more liquid to your recipe or else you will get your cakes like a brick. The general rule is if you add 1 cup coconut flour, you have to add 1 cup liquid too. So you’ll get soft and delicious cake. The high contain of fiber in the coconut flour absorbed a lot more liquid than the usual wheat flour. You can also just replace some part of wheat flour with the coconut flour if you aren’t allergic to gluten. It’s creamier and this flour has terrific taste. The high fiber in the flour helps promote the feeling of fullness. It helps you lose some weight. So you can consumed less food without getting hungry at short time. Coconut flour is made from coconut meat after the oil has been extracted. It’s contain natural sugar and has a mild sweet taste and very creamy. So you can add less sugar to your cake. Use also organic palm sugar to make the most delicious and high nutritious cake. If you’re interested to obtain coconut flour, choose organic. The color has to be soft yellow creamy, not pure white. Coconut has three times as much fiber as it does digestible carbohydrate. 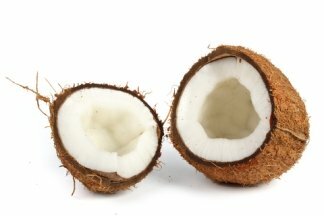 The amount of fiber in coconut is much more than any vegetables or fruits. One cup of shredded fresh coconut (80 grams) contains 3 grams of digestible carbohydrate and 9 grams of fiber. The remaining 68 grams consist primarily of water, fat and protein. In comparison, the same volume of banana, 1 banana (118 grams) contain 2.83 grams of dietary fiber or even broccoli scored far beyond the coconut, it has 2.4 grams of fiber (this is also an excellent amount of health benefits. Broccoli and bananas has other excellent benefits such as Vitamin C, Vitamin K and vitamin A). So, what are you waiting for, let’s bake with coconut flour. Coconut milk is the liquid that came from shredded coconut. It might not too easy to find fresh grated coconut if you lived outside Asia, but you can easily find dried shredded coconut, especially on the Chinese supermarket. There are in abundance. You can make it moist by sprinkled it with some hot water and then steamed it for a half hour. The most easiest way to get coconut milk is to buy it in cans. They are widely available is supermarket. You don’t have to special to go to Chinese supermarket to obtain this milk. If you’re intending to make fresh coconut milk from fresh coconut, you have to grate it by yourself. Or if you can't find fresh coconut to grate it (it's really time consuming to grate coconut), buy dried form and add some hot boiled water into dried grated coconut and soak it for about 15 minutes, and begin to squeeze to get the coconut milk. For dishes such as Serundeng or various desserts where you need a coarser grate, you grate it with the concave side of the coconut facing upwards. After it's grated add 1/4 cup of boiled hot water. Squeeze handfuls of the grated coconut so that the water becomes white and takes up the juices of the nut. Go on doing this until every last of the grated coconut has gone into the water. Strain the liquid through a fine sieve. The first pressing is called thick coconut milk. Add another 1/2 cup of warm water after the first pressing to the grated coconut. Repeat the procedure above. This is called thin coconut milk. Continue adding warm water and squeezing and sieving until you have obtained the amount you need. Thick coconut milk is cooked in different manner from thin form. In coconut milk-based dishes such as gulai or curried, this coconut milk is added towards the end to minimize the danger of the santan separating. Don’t forget to stir occasionally when cooking dishes with coconut milk, especially after adding the thick form. If you don’t, the coconut milk will separate. When you make dessert and cookies or Yellow rice, you must peel the brown skin of it. Your santan will be white as cream and not contain any brown spots. Palm sugar is the nature sweetener that comes from the sweet nectar of palm tree blossoms. To make this sugar, the traditional farmers climb high into the top of palm trees and slice gently the blossoms and then collect the sweet nectar that comes from it. This sweet nectar has to be boiled to get thick caramel and then cooled in coconut shell molds. Some of manufacturer ground it into a fine brown crystal to make it easier to use. If you want to obtain organic palm sugar, choose carefully. Most palm sugar that is sold in the Chinese supermarket is not really pure palm sugar. They are mostly mixed with cane sugar or any other mat based ingredients. Palm sugar has also health benefits like any other coconut products. It has a low Glycemic Index (GI 35). It’s lower than cane sugar, honey or even agave. It contains also protein, potassium, magnesium, phosphorous, zinc and iron. Low GI foods are slowly digested, which mean that they keep you feeling full and satisfy your stomach for many hours. That’s why people who live in Tropical Island which consumed coconut everyday are remain healthy, and they are not fat regardless that they consumed a lot of fat.